This is the start of the $100$ metres in $1896$. 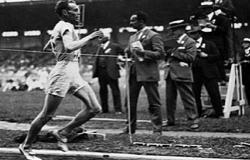 In that year Thomas Burke from the USA won the race in $12$ seconds. I wonder how far you could run in $12$ seconds. You and your friends could use a stop watch and then measure how far you ran. This is the finish of the $200$ metres in $1924$. Jackson Scholz from USA won that race in just over $21$ seconds. I wonder if you could run the $100$ metres in that time? Or you could see how far you could run in $22$ seconds. 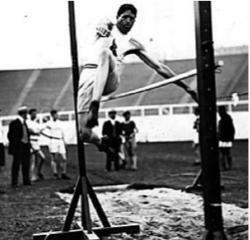 This is the high jump in $1906$. It shows Ray Ewry from the United States. He jumped $1$ metre $56$ centimetres. See how high $1$ metre $56$ centimetres is. Can you find someone who can jump that high? 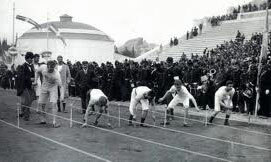 This is the triple jump, which is a hop, step and jump. 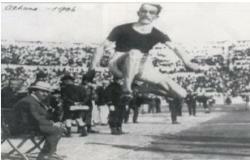 In $1906$ it was Peter O'Connor from Ireland who won a silver medal. He jumped about $15$ metres. What's your best hop, step and jump? Interactivities. Area - squares and rectangles. Length/distance. Addition & subtraction. Time. Comparing and Ordering numbers. Sport. Speed and acceleration. Place value. Mass and weight.